“Without us in there, it looks like an art installation,” Jeff Lorenz says to his business partner Annie Scott, motioning toward the open, sunlit shop filled with inventively arranged plants and hand-crafted garden tools as a warm breeze sweeps up a ten-foot living wall of Swiss chard, Italian oregano, upright rosemary, and spearmint. As co-owners of Tiny Terra Ferma, the new landscape design studio and garden supply shop, which opened on Main Street in Manayunk last week, Lorenz and Scott believe that landscape should be both beautiful and functional. Lorenz and Scott use their expertise to help customers reconsider and reclaim the spaces where plants can grow – window sills, concrete porches, or forty-acre estates – and turn them into hospitable, thriving environments. Scott has worked on high-profile projects, like designing a master plan for Chef Jose Garces’ farm, and Lorenz has almost 20 years of experience in native plant design. The plants in Lorenz and Scott's designs are edible, drought tolerant, indigenous to the Tri-state area, or all of the above. The end results look amazing, and also help to heal our rivers, restore ecosystems, and provide food for humans and animals. The unexpected, artistic pop of Lorenz’s and Scott’s designs makes them novel: planting blueberry bushes around back porches and hearty Redbor kale to accent delicate flowers in Shift Design window boxes, for instance. “Tiny Terra Ferma is about weaving together community, ecology, science, and art,” says Scott, prompting a revision to the old idiom: Good things come in tiny packages. 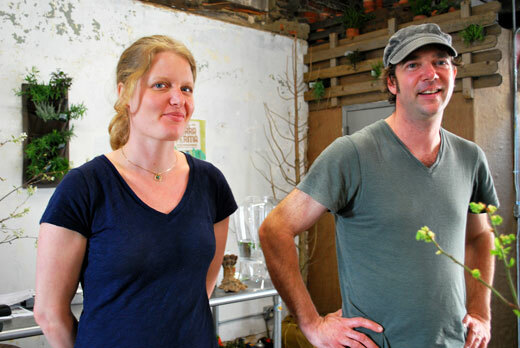 Tiny Terra Ferma landscape design studio and garden supply shop is located at 4324 Main Street, Manayunk. Shop hours are Thursday through Sunday 11am to 7pm. For more information, visit www.tinyterraferma.com or www.facebook.com/tinyterraferma; email tinyterraferma@gmail.com; or, call 267-225-3478. JULIANNE MESARIC is a food & farming writer and communications professional. She recently returned to Philadelphia after studying at Slow Food's University of Gastronomic Sciences in Pollenzo, Italy.